Many people complain that the video quality is not as clear as the original DVD after they ripped DVD to standard video. For an ordinary DVD movie is often 7-8 GB in size, if we convert them to standard video formats the size would be hundreds of MB, so we have to face the problem that the code compress process would destroy most of unimportant data and the video quality get bad. Then what can we do to resolve this issue? The answer is to rip DVD to High Definition video formats, for these HD videos are often bigger than standard video and decrease the video damage. So the HD video seems to be lossless compared with the original DVD. Aimersoft best DVD converter is a decent DVD to HD converter that allows you to convert DVD to HD MKV, MP4, WMV, AVI, MOV, etc. of 1280×720 pixels (720p) or 1920×1080 pixels (1080p). What's more it can convert DVD to portable devices like iPhone, iPad, iPod, HTC, Samsung, Archos, Nokia, PSP, Xbox 360, Zune, etc. Besides, it comes with a built-in video editor that allows you to trim, crop, and rotate videos, add watermarks, adjust video effects, etc. to instantly touch up your videos. Following the intuitive interface, even a novice can finish ripping DVD movies in just a few clicks! Why not just try the free trial version to see whether it meets your needs? 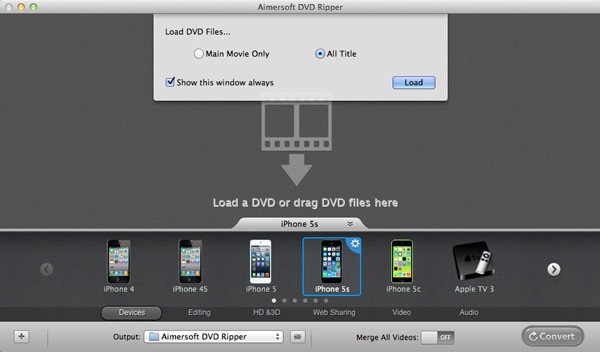 If you're using a Mac, please turn to Aimersoft best DVD ripper for Mac, which lets you convert DVD to HD video on Mac OS X (including Lion, Mountain Lion and Mavericks). Download the right version and follow the steps below to get HD videos from your DVDs. Download and install Aimersoft DVD Ripper on your computer and run it. Now please insert the DVD disc that contains the movie/video you want to convert. Go back to the main window of the program and click the Load DVD button to import the files you want . Next, choose an HD video format as per your needs. There are HD MP4, HD MOV, HD AVI, HD WMV, etc. available for your choice. You can also adjust the output resolution by clicking the Settings button. 720p or 1080p is all up to your choice. 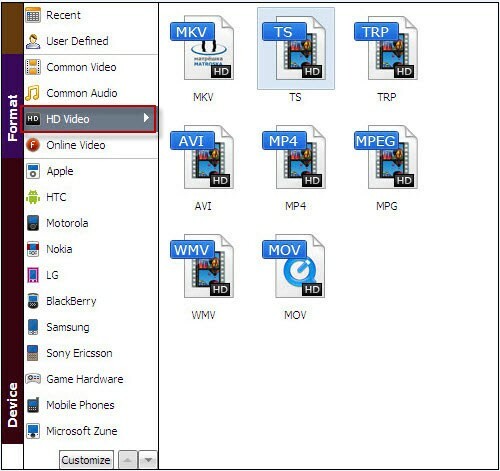 Tip: The DVD ripping software come with preset formats for more than 150 devices, such as Apple TV, iPhone 5, Samsung, iPhone 4S, iPod nano, iPhone 4, HTC, iPod touch 5, Creative Zen, Sony, Sandisk, Motorola, Archos, Nokia, Zune, BlackBerry, iRiver, PSP, Xbox 360, PS3 and more. When you finish all settings, click the Start button to activate the DVD to 720p/1080p ripping process. Movies converted from your DVD files to 1080p will give great visual quality. The only thing is that the larger files with more pixels will result in much slower conversions. Get the Aimersoft tool to start your conversions today! Before starting the conversion, you need to insert the DVD into the DVD drive and launch the Mac HD DVD Ripper. After that, click Files > Load DVD Files or directly drag DVD movies to the main window of the program. Note that you are able to edit the files to personalize the DVD videos. Choose the output format from HD Output option. This Mac DVD to HD converter offers optimized HD H.264 codec and HD MPEG-2 codec for your choice, which include HD MOV, HD M4V, HD MP4, HD MPEG, HD MKV, HD TS and HD TRP. The resolution will smart fit with your computer. If you have special requirements, you can click the Setting button to change the resolution to 1280*720 (720p), 1440*1080 and 1920*1080. The final step is to start the conversion from DVD to 1080p or 720p video. Click the Convert button to achieve this. Bear in mind that the process duration time will depends on the original file size. As soon as the conversion process ends, you can view your new files by clicking on the Output Folder to get the converted videos.